At the April 19 hearing before the House Foreign Affairs Committee; the Subcommittee on Terrorism, Nonproliferation and Trade as well as the Subcommittee on the Middle East and North Africa, the testimony from Jonathan Schanzer, the vice president of the Research Foundation for Defense of Democracies (FDD), was a spectacle that qualified as theater of the absurd rather than a legitimate examination of facts and sound research. The contradiction in the testimony might not dawn on people listening or reading Schanzer’s remarks, titled, “Israel Imperiled: Threats to the Jewish State,” which targets an American organization, the American Muslims for Palestine (AMP), for its criticism of Israel and support of the boycott, divestment and sanction (BDS) movement. Schanzer is not content that U.S. taxes are subsidizing his beloved apartheid state of Israel, but wants Congress to muzzle anyone who makes a serious critique of this settler, colonial state. 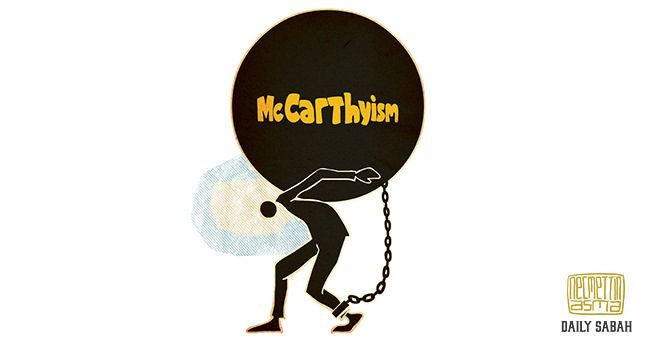 Here, the FDD’s testimony and the congressional committee leadership are giving McCarthyism a new lease on life with the focus being Islamic organizations and Muslim individuals. Guilt by association is peddled at a congressional hearing that utilizes Islamophobia to frame distorted foreign policy priorities. A name change is appropriate for the FDD; it should be called the Foundation in Defense of Islamophobia. The FDD’s board and research focus reeks of Islamophobia from top to bottom, and Schanzer is yet another piece that fits the pattern. Indeed, the committee chair was allowed to stand and admitted into record a testimony that on the one hand states that Schanzer “had seen no evidence of illicit activity” on the part of AMP, yet allowed a 12-page McCarthyism type of dossier to enter into circulation. The FDD and pro-Israel think tanks’ pattern should be deconstructed to understand how it functions. The defaming research was done through a think tank or a front group set up by the vast pro-Israel network – the FDD is such a group – and then makes its way to policy discussions and congressional hearings. In addition, a vast network of Internet sites operated and run by pro-Israel outfits work collectively to cite, republish and share so as to create a tipping point of negative and Islamophobic representation. What we are witnessing is targeted killings in civil society, a strategy that attempts to silence Palestinian voices and curtail the increasing success of the BDS movement in the U.S. and around the world. The BDS movement and AMP’s involvement in it is the essence of democracy and the ability of people to make an informed decision on how their retirement funds are invested, what products they should purchase and the right to call for sanctions on Israel for its ongoing occupation, human rights violations and total disregard of international law. The increased success of the BDS movement around the globe has generated panic both in and outside Israel. Consequently, Israel’s response has been to dedicate massive resources to target activists and organizations to delegitimize the movement in the hope of preventing further erosion of support in Europe and the United States. Let’s be frank, Israel as a product no longer has appeal and, since the last Gaza assault, has become a toxic product on par with Flint, Michigan’s water pipe crisis. Israel’s leadership and society is living in the distant past and thinks that defamation, McCarthyism, guilt by association and Islamophobia will shore up the morally and ethically leaky Zionist pipes. How many more brutal and disproportionate Israeli military attacks should the world be treated to before reaching the moment of saying enough is enough? The AMP’s success in the U.S. is directly connected to Israeli intransigence, Prime Minister Benjamin Netanyahu’s arrogance and the brutality of its death machine, which is no longer possible to hide. The FDD should meditate on the contradiction of its own name, coming to the defense of a state that occupies another people and structurally discriminates against its own Arab and African minority populations. Focus on Iran, Saudi Arabia and other Gulf states’ violations of minority rights would be Schanzer and his FDD colleagues’ retort as if this is an answer or a real defense of Israel. Yes, the FDD and its researchers will treat all of us to the empty canard that Israel is the only democracy in the Middle East, which is used as the holy grail defense whenever human rights violations and war crimes are introduced into the discussion, but this no longer can carry the day. Democracies are measured by the principles of equality, justice, fairness and dignity for all. Thus, the propensity of Israel’s defender to point fingers at other countries is an insult to human intelligence, let alone being an admissible argument in defense of an apartheid state. The FDD should change its name to the Foundation for the Defense of Apartheid Democracies, which is exactly the case in its fictitious attack on the AMP. Had the FDD taken its name seriously, it might spend some more time calling for an investigation of the American Israeli Public Affairs Committee (AIPAC) as an agent of a foreign country and its role opposing U.S. foreign policy in the Middle East for the benefit of Israel. Indeed, we should expect a defense of U.S. democracy at a time when Congress is more apt to take direction from Netanyahu than U.S. President Barack Obama or the American people. Or maybe, since Schanzer is so committed to democratic principles, how about spending some time on exposing Zionist funding coming from U.S.-based individuals and groups that help build and drive settlement expansion in the West Bank, which is a violation of existing U.S. policy?